I have three cartons of boxes of jigsaw puzzles in my living room, featuring a lovely hand-drawn map of the village. The puzzles are 500 pieces, and will let you see where all your favourite characters from the Greek Village live! There’s a limited number, but if they prove popular I’ll get some more made up. If you want a puzzle, please refer to the table below. Payment can be made to the following PayPal account:saraalexi@icloud.com, and I’ll post out your puzzle on receipt of payment. All profits from the sale of these Greek Village Series Tote Bags will go to the Hellenic Red Cross who are helping refugees in Greece. 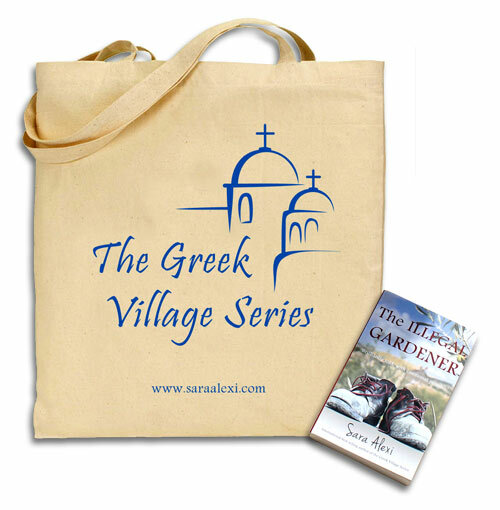 I’m thrilled with the Greek Village Series tote bags!! But I’m even more thrilled to offer all profits to the Hellenic Red Cross to help the people coming into Greece at this time. If you are outside of the UK / USA / Europe, please contact me by email: saraalexi@icloud.com, subject “Tote”, and I will reply with the shipping cost.